Virtual reality is, at the moment, mostly concerned with your squishy orbs of sight. It’s all about slapping stuff on your face. And that’s fine, but it does create a bit of dissonance. It’s your hands that are doing the walking, specifically your thumbs, for the most part, and unless you normally walk on your hands, that’s a wee bit awkward. There are already a few solutions to that problem, most of them being treadmill-like devices that will take up a massive amount of space, creating another problem. 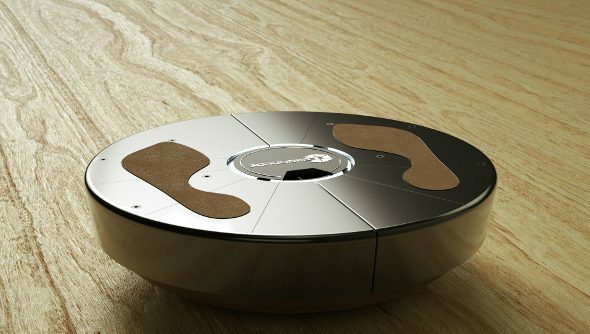 3DRudder, which is on show at CES, nips that issue in the bud, because it’s the size of a frisbee. It’s also a bit weird. Unlike the treadmills, 3DRudder doesn’t make you walk on the spot. It’s a disc-shaped balance board that can also spin. If you spin, you can look around, if you lean, you can strafe, and you can use your feet to move the camera and zoom in and out. So rather than simply simulating walking, it gives you full camera control with your feet. I wonder if, as well as freeing up hands, it could – in some games, though probably not shooters – remove hands from the equation entirely. For those with arthritis or other problems that makes it difficult to use controllers or a mouse and keyboard, it could be a boon. It should also make it easier to hold a beer in each hand while gaming, which is something I’ve dreamed off for many years. It’s certainly one of the most interesting motion control prospects in development. Early adopters can pledge $110 and get one for themselves.